Befouled Maze of the Demi-Lich Released! 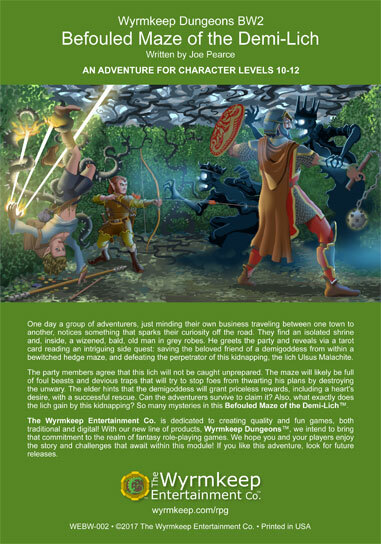 Wyrmkeep Entertainment Board > Role-Playing Games > General Role-Playing Games Forum (Moderator: WyrmMaster) > Befouled Maze of the Demi-Lich Released! Wyrmkeep Dungeons BW2: Befouled Maze of the Demi-Lich is now available to order at wyrmkeep.com/rpg. In this 5e fantasy adventure module designed for 6 to 8 characters of 10th to 12th level, a bold party is tasked with defeating the foes and traps placed by the lich Ulsus Malachite in an enchanted hedge maze and rescuing the beloved companion of a demigoddess. Can they succeed and earn the deity's rewards? 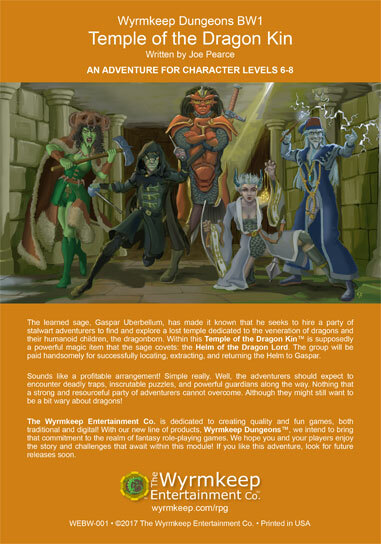 Also take a look at our first 5e module, Wyrmkeep Dungeons BW1: Temple of the Dragon Kin. More adventures are in the works!